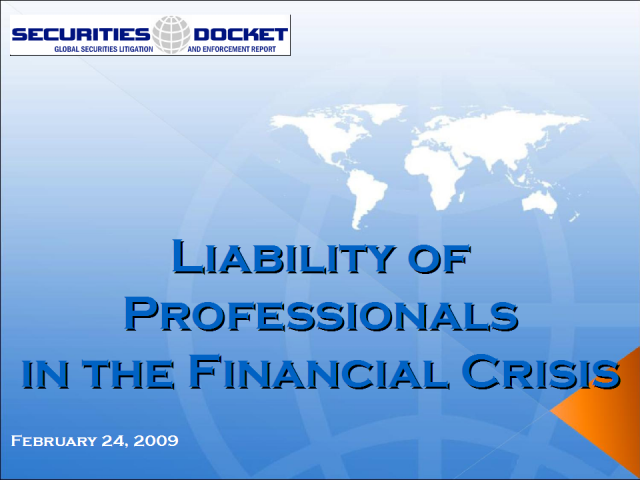 This webcast featuring two of the top lawyers in the securities litigation field addresses critical questions now arising as to the potential liability of professionals in the financial crisis. Auditors, investment banks, rating agencies, lawyers, and others are now in the crosshairs of investors seeking to recover massive losses. Please join panelists Stuart Grant of Grant & Eisenhofer P.A. and Michael Young of Willkie Farr & Gallagher LLP as they address these issues as well as your questions in a free, one-hour webcast. Moderated by Bruce Carton, Editor of Securities Docket.